Welcome- BLOOD FOR THE BARON!!! Welcome to Blood For The Baron, the world's premier Action Force website. Please take a moment to register at the forum. There you will find all the news and updates regarding BFTB and get the chance to meet and chat with Action Force fans from around the world. Membership is absolutely free. Please use the forum for any queries or suggestions and to report any broken links or corrupted files. We are always looking for more information and images; if you would like to become a site contributor, please send me a Private Message. The BFTB Toys archive is a complete reference guide to the UK Action Force toyline, but is still very much a work-in-progress. Navigating the Comics archive couldn't be easier. The stories are arranged in chronological order and displayed as flash galleries. Just click on the first title in each index and you're away. 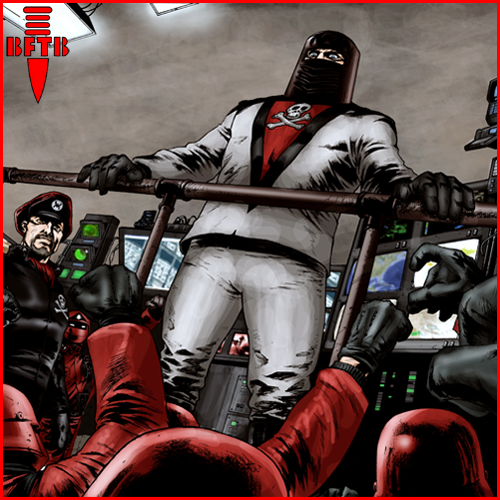 We have many Fan Projects on the go, including our own comic Red Dawn! There are some excellent Action Force Customs on display and for sheer madcap fun, check out the Dioramas. One unique aspect of the site is the Colouring Project. Working with colourists from all around the world, we re-released a classic episode from Battle Action Force in full colour every week for many years. Our pet engine of destruction, the Travelling Muton, is cutting a bloody swathe across the globe. Send me a PM if you would like him to come and destroy your hometown! 30th Anniversary Commemorative Special are both available for a short time before going to print. The cut-off for all orders is the 9th of May 2017.